Benin (former Dahomey) became independent from France in 1960. A 99-year lease on a staff house at 10 Commercial Avenue had been bought in 1957. 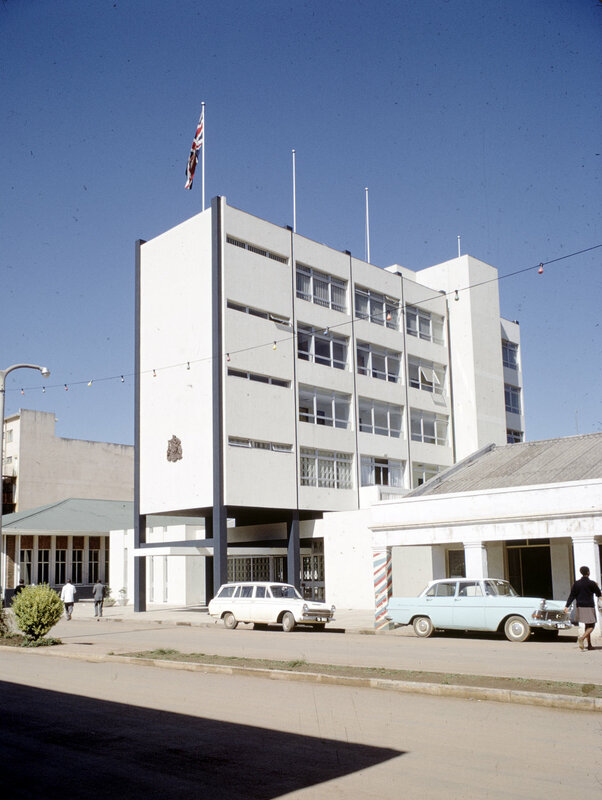 Offices were leased in UAC Building No 1 on Siluko Road and a residence (which was subsequently bought in 1964) at Plot 114 in the Government Residential Area. The Post closed in 1975. Gaborones offices, entrance front, 1971. Burundi became independent from Belgian administration in 1962. 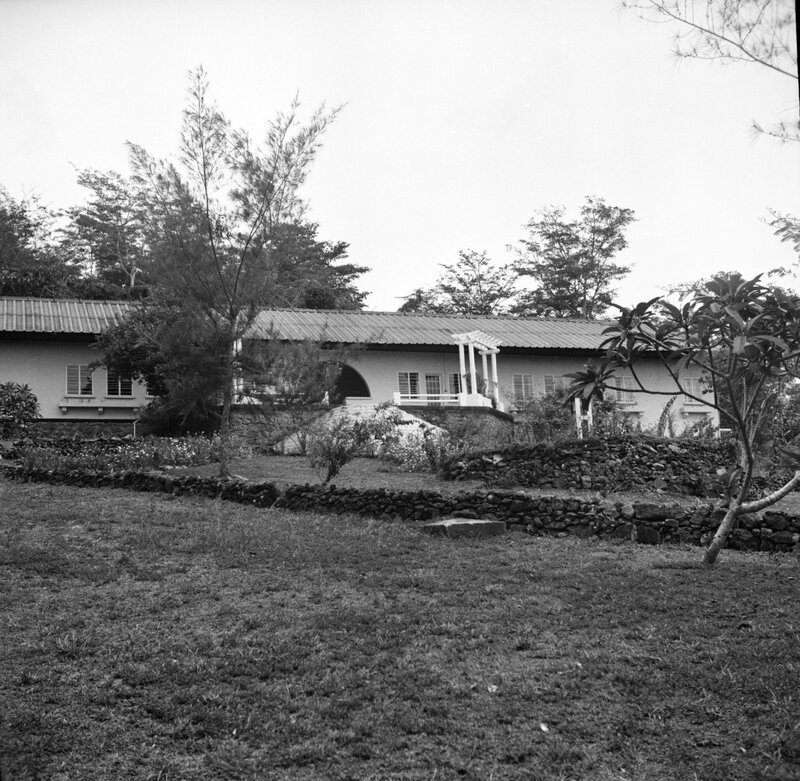 A residence at Chaussée Prince Louis Rwagasore was bought in that year for £9,000 and an office at 906 Avenue des Euphorbes, known as ‘Old East House’ was bought in 1965 for £11,000. Cameroon became independent in 1960, with Yaoundé its seat of government, and joined the Commonwealth in 1995. The offices were first leased on Plot 197 Avenue Joseph Clercon and then, from 1969, on the 9th floor of Le Concorde Building on Avenue JF Kennedy. The residence, Balla House, was first leased in 1964 on what was then Lot 183 Centre Urbain and is now on Avenue Winston Churchill. The intention was that a new residence should be built, and a site for this purpose was leased in 1973 for 75 years at Mvolye. 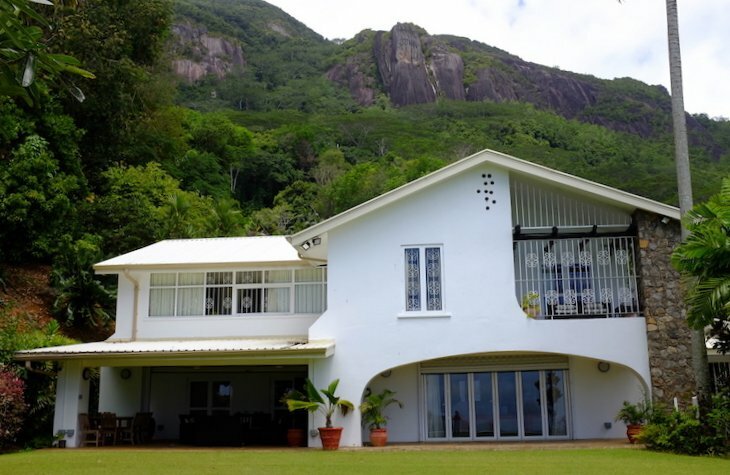 These plans were, however, set aside in 1978 when the single storey Njike House at Ekoudou, Bastos, was leased and occupied for a trial three years. It was found to work well as the residence and a 15 year lease was taken on it in 1981: the Mvolye site was sold in the same year. The vacated Balla House was then converted into offices, into which the embassy moved from Le Concorde in 1979: it was extended in the 1980s and remains the offices. Yaounde [Which building is this? ], 1962. Anjouan (formerly Johanna) is one of the Comoros Islands that lie just east of the northern tip of Madagascar. France gradually established colonial rule over the islands between 1841 and 1912. A site for a consulate was presented by the sultan to Josiah Napier on his arrival as consul in 1848. Here Napier began to build a house for himself but died before it was completed: the British government bought the house from Napier’s brother and completed it. Napier’s successor as consul, William Sunley, resigned his commission in 1865 rather than give up his employment of slaves, and the house began to decay. In 1874, by which time it was in a ruined state, the new sultan was permitted to use it as a storehouse for coconuts. John Kirk in Zanzibar became consul in 1875 and debate arose about whether to dispose of the property. A visiting naval vessel was asked to advise and reported that the site was so well located as to have value, perhaps as an Admiralty store, and should not be disposed of. But no requirement was found for it, the Comoros Islands gradually sank further into French protection and British interest waned. The old consulate ruin was again sublet to a local resident in 1912. In 1920, there was a swap of two strips of land to facilitate a new road, and the site was sold to the government of Madagascar in 1925 for 13,500 francs (which was entered into the Office of Works books as £131:1:4). NOTE: this gentle saga is drawn from WORK10/24/4 at The National Archives. The republic became independent from France in 1960: Brazzaville, the capital, lies on the north bank of the Congo River, opposite Kinshasa. The residence, Villa Cotonaf on Avenue Monseigneur Augovard, was bought in 1961 for £21,000, and a staff house, Villa Grosperrin on Avenue Faidherbe, in the same year for £19,000. The offices were in Allala, a detached villa at Avenue du 28 Aout 1940. The Post was vacated during a break in relations between 1965 and 1968 during which the property was sublet to the Algerian Embassy. The Post was closed in 1991 and covered from Kinshasa. Côte d’Ivoire achieved independence from France in 1960. Abidjan became the capital city in 1931. Although Yamoussoukro, 200 kilometres inland, became the political and administrative capital in 1983, embassies remain at Abidjan, which remains the country’s commercial centre. 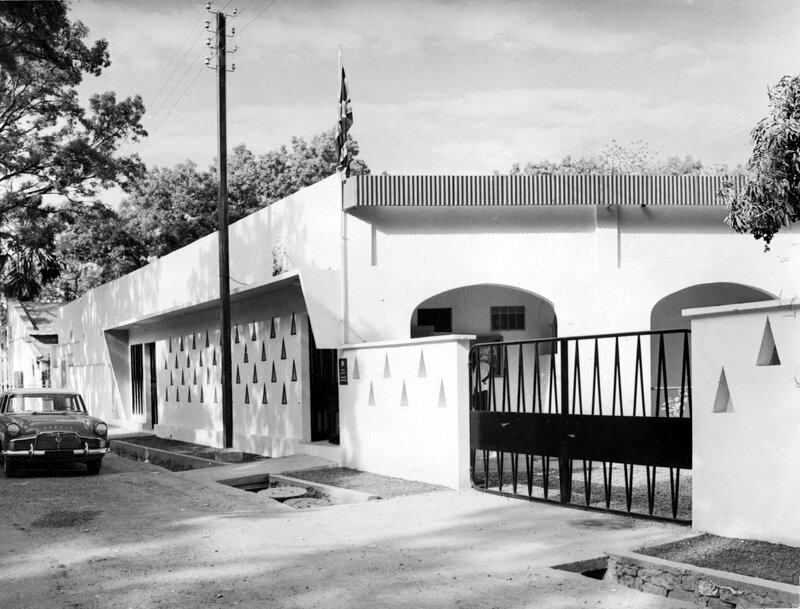 Before independence, consular residences were leased at 20 Rue de la Canabière and, after 1954, at 7 Rue des Bougainvilliers, Cocody. The intention in the late 1960s was to build a new residence and, to that end, Lots 34 and 36, beside the golf course on the ‘Riviera Africaine’ in the diplomatic quarter, were reserved. But the idea fell away and, after some improvements had been made to 7 Rue des Bougainvilliers, its lease was renewed for fifteen years in 1971, then five from 1986 with an option to renew. The house was replaced in the early 1990s [?] by the purchase of Le Bellec House, also in Cocody: it was bought while still half-built and finished off to the Foreign Office’s requirements. Offices were leased from 1965 on the 5th floor of Shell Building, Avenue Lamblin, But the fire risk became unacceptable and the 3rd floor of Immeuble Les Harmonies, on Boulevard Carde, was bought in 1980 for £370,000. The offices remain there. Spain in effect lent the island of Fernando Po to Britain from 1827 to 1844 so as to establish a naval base, Port Clarence, to support the suppression of slave trading. When Spain re-asserted its rule, it changed Port Clarence’s name to Santa Isabel and later to Malabo. In 1849, Britain appointed John Beecroft as its consul, a role that in the times of the British presence carried the additional title of governor of the colony. A bungalow residence/consulate was sent from Britain and erected in 1856. It gradually fell into decay after the withdrawal of the consul and proposals to replace it in 1880 and 1912, when the consular post was each time temporarily revived, came to nothing. The property was still, however, on the Office of Works’ books in 1915. Gabon became independent of France in 1960. Accommodation was taken on relatively short leases, and given up when the Post closed in 1991. Guinea gained its independence from France in 1958. The old part of Conakry was on the small island at the tip of the Kaloum peninsular, up which the modern city has grown. The first embassy office, and several of the first flats for UK staff, were leased in 1960 in Le Paternalle, at the time the town’s largest building of about 15 floors with a podium. 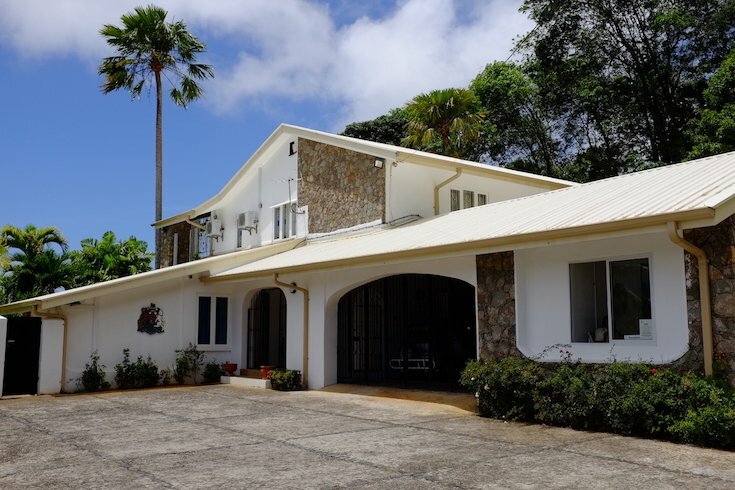 The offices moved in 1961 into a converted clinic on the south side of the island, on which a nine-year lease was taken. By then, the Post comprised nine UK staff, five of whom lived in flats in Le Paternalle. The residence was leased a few miles up the south side of the peninsula between the road to the airport and the sea. 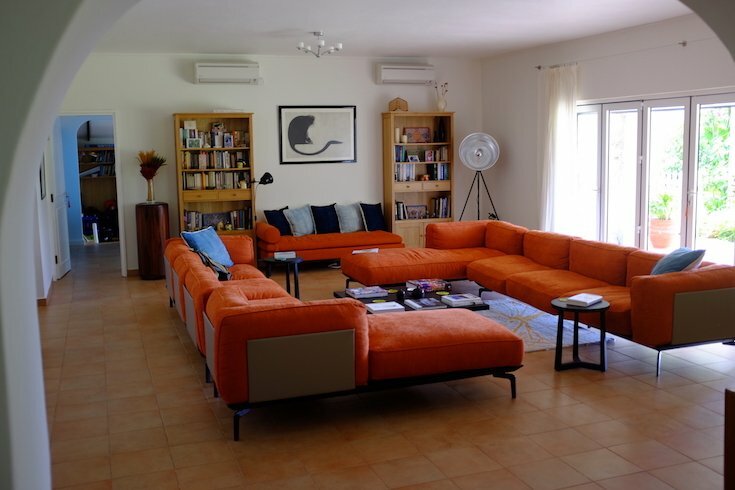 Called La Ninette, it was a small Riviera-type seashore villa, and was leased for seven years from 1959. A larger residence became necessary by 1962, but searches yielded nothing better. Plans were made to buy an adjacent site and build a new residence but they came to nought. The ambassador was withdrawn to Bamako, in neighbouring Mali, in 1965. The Kingdom of Lesotho (former Basutoland) became an independent and sovereign member of the Commonwealth in 1966. Its prospective government in 1965 granted, free of charge, four sites on which the British government would build the buildings that its high commission would need. All were completed in July 1967. 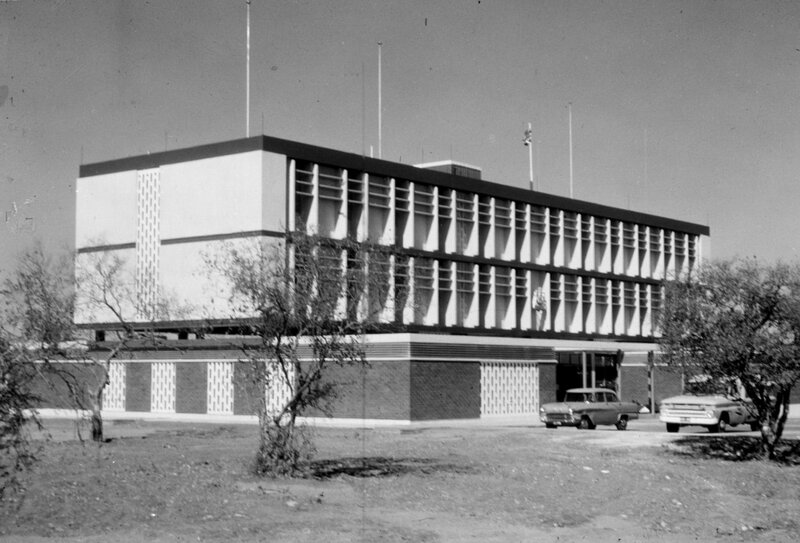 The offices, at Plot 99, Maseru Central, was a two-storey building designed by local architects John Stanbridge and Househam, of Bonhomme House, Maseru. The two-storey residence, at Site 256 on the Europa Maseru reserve [? now Kent House at 256 Pioneer Road], about l½ miles from the office, lay in about 1.7 hectares of grounds and cost about £60,000 to build. Staff accommodation comprised three terrace houses at 1, 2 and 6 Maluti Road, four bungalows at Tonakholo and Caledon Roads, and a staff flat at the offices. The Post closed in [?]. Mali (former French Sudan) achieved independence from France in 1960. A residence and an adjacent building site were bought in 1961 for £13,000 in Quartier du Fleuve. The residence was sublet to the American embassy during the diplomatic break of 1965-68, with the option to purchase. The Post closed in 1969: it re-opened in [?]. Mauritius became independent within the Commonwealth in 1968, and a republic in 1992. The freehold of a house suitable to be the residence, with about five acres of grounds, on King George V Avenue in Floreal, was bought from a Mr George Taylor in 1966 for £37,500: it was subsequently named Westminster House, and remains the residence. Five other houses were bought in 1966: Severn Lodge (formerly ? Chazal) on King George V Avenue for the deputy high commissioner, Conway Lodge (? Bruneau), Trent Lodge (? Poupard), Foyle Lodge (? Largess), and Spey Lodge (? Rousset). Known as German South West Africa until 1968, Namibia gained independence in 1990. Three houses were bought in 1978 for what was then the British Liaison Office: one at Erf 5525 Promenaden Road as residence for the head of Post for £40,000, and two at Erf 103 Leutwein Street for office and a staff unit for £33,000. A larger residence was bought in 1989 for £155,000 at 13 Conrad Rust Street, and the two adjacent Leutwein Street houses were adapted as offices: the street name changed to Robert Mugabe Avenue. Seychelles became a separate (from Mauritius) Crown Colony in 1903, and gained independence as a republic within the Commonwealth in 1976. Offices were leased on the third floor of Victoria House, Mahe. The freehold of a 0.26 hectare site for the residence, at Curio in Bel Air, with magnificent views out to sea, was bought in 1977 and a house to local specifications completed on it in 1979, at a total cost of about £125,000. Victoria residence, garden front, 2017. Victoria residence, drawing room, 2017. Victoria residence, front entrance, 2017. Sierra Leone achieved independence and became a member of the Commonwealth in 1961. 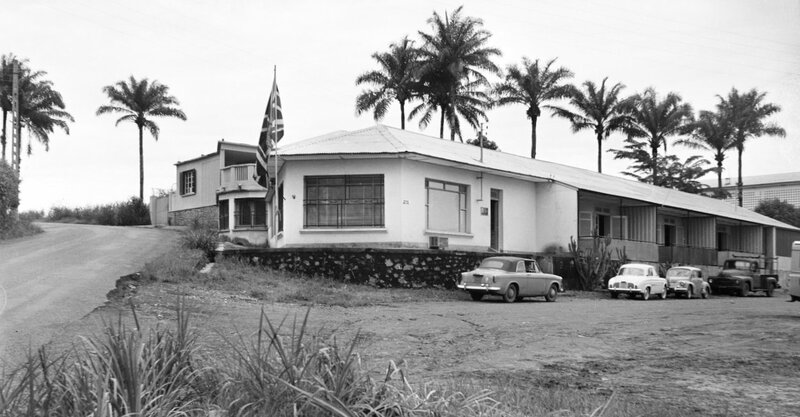 All the British War Department’s property was transferred to the colonial government, save for about 4.6 hectares that was transferred in 1961 on 99-year leases to the Ministry of Works to meet the high commission’s needs. The transferred land comprised a site for the residence on Regent Road (on which a new residence, named Runnymede, was completed in 1965); a site for the deputy high commissioner’s house on Hillcot Brow; a compound on Spur Road with five houses and a two-storey block of four flats; and a three-storey block of six flats on Loop Road. Offices were first leased in the Standard Bank of West Africa Building, 9 Oxford Street, in 1961, where they remained until the 1980s [though the name changed to the Standard Bank of Sierra Leone Building? ], when some of the accommodation in the Spur Road compound was converted to offices use. Swaziland became independent in 1968. The Ministry of Public Building and Works acquired the freeholds of a 0.9 hectare site for offices and two sites for staff housing in 1966, and was given the free grant of a site for a residence in 1968: all the accommodation was built in 1968. The Ministry later acquired two more staff houses in 1972 and 1974. The office building, between Miller and Mac Streets, had a small plan area but five storeys, and included two staff flats on the first floor. The residence, in St. Michael’s Road, was built at a cost of about £50,000 but to reduced standards insisted upon by the Chief Secretary to the Treasury (an extension to the reception rooms was added later). Six houses were built in a single complex at 13, 15 and 17 Schoch Street and, backing on to them, 36, 38 and 40 Gilfillan Street, and a single house for the head of chancery at 5 Schoch Street. Togo achieved independence in 1960. A combined office and residence building was leased on Boulevard Circulaire in that year. Two sites for new office and residence were bought in 1963 and 1964, both on Boulevard de la Republique. These sites were sold to the German government in 1969 after the lease on the Boulevard Circulaire building was renewed for five further years. The Post closed in [?.